Army Specialist Ryan Wilcox first deployed to Iraq as a combat engineer with the 479th Engineer Battalion in 2007. During that deployment on March 13, 2008, he sustained a gunshot wound to his right leg while on a route clearance mission. Upon his recovery, he returned to active duty and deployed to Afghanistan in 2012 with the 444th Engineer Battalion. During this combat tour, SPC Wilcox endured chronic pain in his leg due to extensive nerve damage and residual scar tissue, resulting in his medical evacuation from Afghanistan on June 7, 2012. SPC Wilcox was subsequently treated at Walter Reed Medical Center for over 18 months. After several surgeries and nerve grafts, he underwent the amputation of his right leg below the knee. Now medically retired, Ryan enjoys spending time with his fiancée Sara and their two children, Nicholas and Juliana. Within his previous home, however, he faced barriers such as thresholds and stairs, which limited activities he could do with his family, including reading to his children at bedtime. Accessing his backyard was also challenging, often preventing him from accompanying them when they would go outside to play. Ryan’s specially adapted custom HFOT home alleviates those obstacles for Ryan and allows him to focus on his continued recovery. The freedom of navigating throughout a home that is barrier-free and situated on a level lot, Ryan says, relieves much of his daily stress and gives him more quality time and energy for his family, hobbies, and goals. “It’s not just walls and a roof – it’s allowing a Veteran to be with his family,” he says. 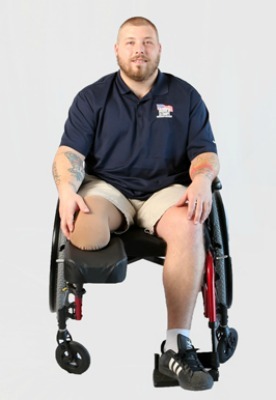 Ryan’s future plans include finishing his college degree and establishing a career working with other Veterans. Living in a donated home allows him to save money toward his children’s futures. He also looks forward to becoming more active in his son’s sporting events and getting back to hunting and camping again. Originally from upstate New York, Ryan chose to build his home there to be close to family. Ryan says he appreciates the support demonstrated nationwide by Homes For Our Troops’ supporters. “I am thankful there are people out there who care for our Veterans. HFOT supporters are transforming lives on a regular basis and I cannot say ‘Thank You’ enough to everyone involved,” Ryan says. WWNY TV, Sept. 29, 2018 Saturday morning, Army Specialist Ryan Wilcox was handed the keys to his new home in Mexico, N.Y. The home was provided by the group Homes For Our Troops. Read more. Local SYR, Sept. 29, 2018 A local injured Veteran moved into his new home Saturday afternoon. It was built from scratch with the help of Homes For Our Troops, a non-profit helping post-9/11 service members. Read more. Spectrum News, Sept. 29, 2018 It was a very special day for one Oswego County Army Veteran and his family. Homes For Our Troops presented retired Army Specialist Ryan Wilcox and his family a new home in Mexico, N.Y. The house was built specifically for Wilcox’s needs. Read more. Syracuse.com, March 28, 2018 An Oswego County veteran will be moving into a brand-new home later this year, free of cost, thanks to Homes For Our Troops, a national nonprofit that builds homes for severely injured post-9/11 Veterans. Read more. American Homefront Project, Feb. 19, 2018 Army Veteran Ryan Wilcox is 29, easy going with a big sandy beard. Usually, you can’t tell that he’s wearing a prosthetic. His leg was amputated below the knee because of complications from a gunshot wound he got in Iraq in 2008. Walking is hard, so most of the time he uses a wheelchair. He says getting around in his house is like navigating an obstacle course — one where he gets wedged in doorways a lot. Read more. Spectrum News, Jan. 27, 2018 In 2008, Army Specialist Ryan Wilcox was shot in the leg while being deployed in Iraq. He later returned to active duty in 2012 and was deployed to Afghanistan. Shortly after, nerve damage in that leg forced doctors to amputate it, which made living at home difficult.Now the organization Homes For Our Troops is building Ryan and his family a home to fit their needs. Read more. CNYCentral, Jan. 27, 2018 Army Specialist Ryan Wilcox celebrated Saturday with the kickoff of a project aimed at building a new home for him and his family, thanks to an organization with the motto “building homes, rebuilding lives.” Read more. The Watertown Daily Times, Jan. 14, 2018 Army Specialist Ryan Wilcox is longing for things many people take for granted. He is looking forward to playing with his children in the yard, tucking them into their beds at night and even preparing a meal or taking a shower without needing help. Read more.